I couldn't believe how great this vacuum is. It turns easy and actually brought up the nap on a flat pile area rug. Dealyard is your source for great deals on brand name products. Outstanding customer service has always been a hallmark of the DealYard brand. We're also proud to offer fast, free shipping on every order. DealYard sells products in many different categories including, Bed & Bath, Kitchen, HBA, Sunglasses, Home Improvement, and more. DealYard has been ranked as one of the leading e-retailers by Internet Retailer and ranked as one of the fastest growing private companies in America by INC5000. For customer service inquiries or to initiate a return, please contact DealYard at info@dealyard.com or 866-320-3325. You can initiate a return for new and unopened items within 15 days of delivery for a refund. To qualify for a refund, items must be in new and unused condition with all original materials and/or accessories. If a return is not received at our processing facility within 30 days, it may be subject to a partial refund. You will be responsible for return shipping costs. However, if the return is a result of a fulfillment error, product defect, or damage incurred during shipping, we will refund the full cost of the merchandise. We will provide a pre-paid return shipping label for Non-Buyer's Remorse returns. All returns are subject to inspection, and if found not to be an error on our part, the return shipping costs will be withheld from your refund. SPECIAL RETURNS INSTRUCTIONS: Once the seller approves the returns request, they will provide a Returns Merchandise Authorization. The Seller cannot accept returns for used items. The Seller charges a restocking fee of 15% that will be withheld from the refund. 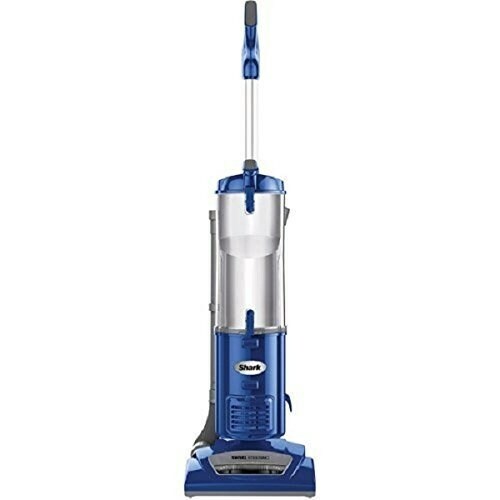 Quickly and easily vacuum bare and carpeted floors with the outstanding Shark Navigator Swivel Plus, NV46 upright vacuum. This durable item includes a large capacity, bagless dust cup. This lightweight swivel steering provides complete control to easily maneuver around obstacles and furniture. This upright vacuum cleaner includes a convenient, extra-long, cleaning reach wand that rides on board for versatile cleaning. The deluxe motorized brush roll can be turned on or off, providing superior performance on all floors. This lightweight vacuum handles very well and the swivel feature is sure to be enjoyed. The included dusting brush, crevice tool and pet upholstery tool can be used on all types of furniture and surfaces. Clean up after a pet with no problem using the pet upholstery tool and the crevice tool will get to those hard-to-vacuum spots and get the job done. This is my second hark vacuum. It does a very good job but is heavier and harder to maneuver than my other model. I don't think you can go wrong with any Shark vacuum. They do an excellent job of cleaning both carpet and hardwood flooring. I do like the brush option that you use for carpets and it can be turned off easily for the flooring. Reason for the four instead of five were the instructions or more the lack of good instructions to put the thing together. LOVE this vacuum. Amazing suction, easy to maneuver, and lighter than expected. Love it!!! My Shark stopped working after 5 years. Great product for a great price!! Fantastic! I love it! Easy to maneuver.